We’ve slowly been transitioning our Citrix XenApp environment from static VMs to Machine Creation Services (MCS) based VMs. My goal was to have two master (fat) images and two machine catalogs. Because of policy and application segregation requirements those two catalogs translated into more than two delivery groups. With these delivery groups came the requirement to apply different group policies to different machines. One option would be to move the corresponding AD object into a different OU and apply policy that way. While that would work due to AD objects not being automatically moved/re-created after machine creation it still requires some administrative overhead. It was clear that dynamically adjusting certain policies based on delivery group membership would be ideal. After a little digging I found where both the delivery group and machine catalog memberships were written to in the registry by the VDA. 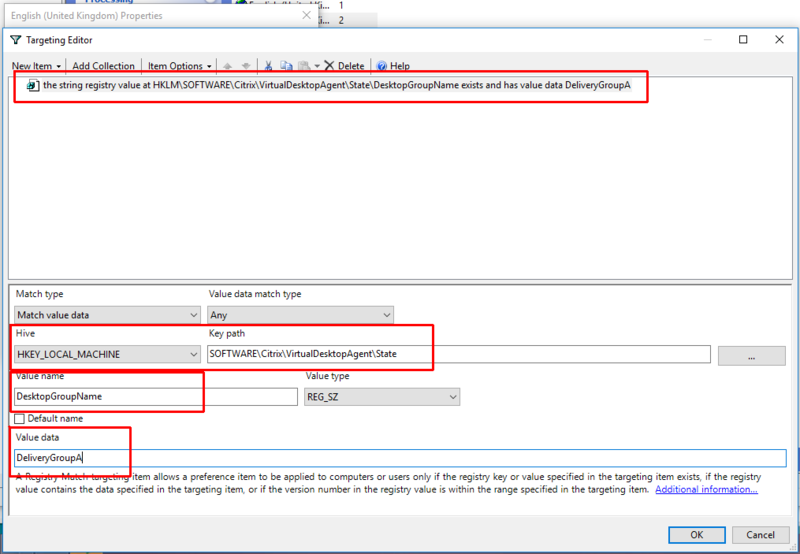 Below is an example of how we applied a user GPP item dynamically based on the delivery group of the machine. This entry was posted in Active Directory, Citrix and tagged active directory, citrix, gpp, group policy, machine creation services, mcs, xenapp, xendesktop on February 12, 2019 by Mark DePalma. How would I decide/maintain what users have their passwords replicated to the RODC? How do these passwords get replicated to the RODC? By design passwords are only replicated to an RODC after an initial authentication attempt when they are configured for password replication. Since the sole reason this domain controller is being deployed is for PAN-OS I don’t want it to handle logons and I want to make it very lightweight. How do I prevent user logons/authentication from occurring on this DC? How are usernames identified? Will it handle all formats (samAccountName, explicit UPN, implicit UPN, and email address)? This one is pretty easy for me. I don’t see any reason to exclude any accounts from credential detection, so I will use ‘Domain Users’. I usually stay away from using default groups, but this is one of the few cases where it makes sense to do so. How do these passwords get replicated to the RODC? I turned the logging level up to verbose (HKEY_LOCAL_MACHINE\SOFTWARE\Palo Alto Networks\User-ID Credential Agent\Log | DebugLevel=5) on the credential agent after full configuration and saw that the agent enumerates all the objects within the ‘msDS-Reveal-OnDemandGroup‘ attribute of the RODC computer object (and DNs manually specified in the user-id agent seen in the screenshot below) and executes ‘repadmin‘ against each object to force replication. As password changes are detected it re-replicates passwords using the same method. How do I prevent user logons/authentication? After experimentation it is clear that when using the domain credential filter method PAN-OS is getting the user from the IP<->user relationship and only looks for that user’s password in web site submissions. No matter what username I put in a form the submission triggered a detection as long as the password matched my password. Another user’s credentials under my session did not trigger a detection. I was happy with this because I do not have to worry about certain username formats not being detected. The issue here is that the credential agent only runs under LocalSystem and assigning a non-administrator account to the user-id agent service prevents the user-id agent from communicating to the credential agent’s named pipe. Leaving the user-id agent service running under LocalSystem worked, but created another problem. When running under LocalSystem for some reason it was unable to enumerate the ‘msDS-Reveal-OnDemandGroup‘ attribute (seen in the UaDebug.log file) for the RODC meaning it couldn’t determine what user accounts were allowed to sync to this RODC. I found that if I manually specified a group DN in the user-id agent it would work under LocalSystem. The only other option would be switching to a ‘DOMAIN\Administrators’ service account (since this a domain controller) which I did not want to do. Since I’m only using ‘Domain Users’ this was easy enough to configure. UPDATE: There seems to be a discrepancy between how the User-ID agent worked previously, the current documentation, and how it works now. 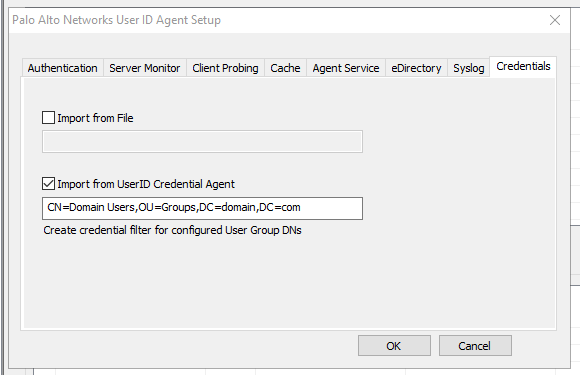 In the past the User-ID agent configuration utility would adjust the ‘Log on as’ value for the ‘User-ID Agent’ service to the account you specified in the agent setup ‘Authentication’ tab. It seems now the service continues to run as LocalSystem, but uses the account specified in the configuration to actually probe the DCs and AD. I was able to leave it running as LocalSystem, specify an account with the proper rights in the ‘Authentication’ tab, and leave the group DN blank under the ‘Credentials’ tab in the user-id agent configuration utility. I verified the agent was using the account via logon events in the security event log on the RODC. After configuring this you can monitor both log files to verify proper operation and then later verify PAN-OS is properly receiving the bloom filters. Be sure to restart the user-id agent after making any changes. 02/08/19 12:43:46:593[ Info 2896]: Received BF Push. Different from current one. This entry was posted in Active Directory, Security and tagged active directory, credential, domain controller, named pipe, palo alto, pan-os, phishing, rodc on February 11, 2019 by Mark DePalma. Last week I had deploy a new domain controller to the root domain in a forest (it happened to be an RODC for a unique use case, but that is irrelevant). The domain only partially replicated before failing and showing errors on the new DC. Replication of application directory partition DC=domain,DC=com from source 24c77a2c-6da0-41a1-95cf-e0542bca5b89 (dc1.domain.com) has been aborted. Replication requires consistent schema but last attempt to synchronize the schema had failed. It is crucial that schema replication functions properly. See previous errors for more diagnostics. If this issue persists, please contact Microsoft Product Support Services for assistance. Error 8418: The replication operation failed because of a schema mismatch between the servers involved.. The directory service could not replicate the following object from the source directory service at the following network address because of an Active Directory Domain Services schema mismatch. The security descriptor propagation task could not calculate a new security descriptor for the following object. If this condition continues, attempt to view the status of this object and manually change the security descriptor. All problems preventing updates to the Active Directory Domain Services database have been cleared. New updates to the Active Directory Domain Services database are succeeding. The Net Logon service has restarted. This entry was posted in Active Directory and tagged active directory, adsiedit, domain controller, replication, schema on January 7, 2019 by Mark DePalma.